Plant of the month. July 2014: CONEFLOWER OR ECHINACEA – Glacier View Landscape and Design, Inc.
Their mixes of colors range from red, scarlet, orange, purple, yellow, cream, and white. Perhaps someone someday will cultivate a pure black one! 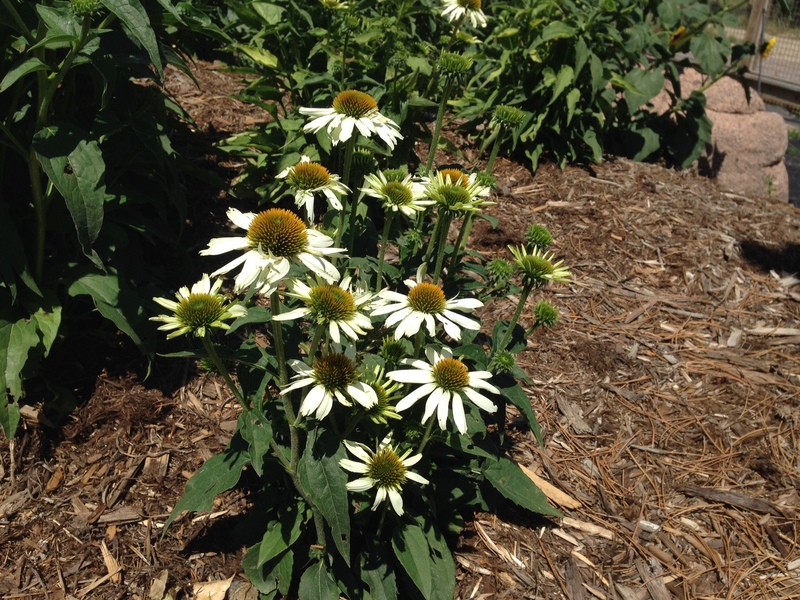 Echinacea angustifolia is the more drought tolerant of the cultivated varieties and will thrive in clay to clay/loam soils with minimal additional moisture above and beyond the natural precipitation on the Front Range of Colorado. They tend to look sparse and flower poorly in the native setting, but will thrive in a cultivated garden. They will not thrive in very wet settings, though all Echinacea will seed themselves readily into areas of the garden where the moisture is appropriate for the species. E. angustifolia have a thinner basal leaf than the more commonly planted variety for cultivation. More commonly planted in perennial gardens is E. purpurea which has numerous cultivars of varying colors and sizes. The species color, as indicated by the name is purple, and is beautiful specimen that climbs on single stalks above its basal leaves to 24”-36” tall. There are a few varieties of purpurea which are a little more compact at a minimum of 12”-18”, though most reach the 3’ height easily, and some, in the ideal conditions will top at 4’. They are a fabulous backdrop plant or mid garden plant in a contrived perennial bed planting. Some of my more favorites are ‘Fragrant Angel’ which has full foliage at the base, large cream to white flowers and a sweet smell. ‘Happy Star’ is also white and is one of the taller varieties, a cultivar of ‘Ruby Star’. These are unique in that their petals tend to not droop as some other varieties tend to do, and are held upright and out away from the spiny center. ‘Magnus Superior’ is a deep pink variety with copper colored cones. These are a show stopper! ‘White Swan’ have large flower heads. ‘Evan Saul’ or Sundown is more orange surrounding a dark center cone, and one of the latest varieties is called ‘Tomato Soup’. This is deep red with orange stripes in the center of the petals which stands out brilliantly from the green foliage. E. pallida, or pale coneflower is generally used more in native prairie settings, and is distinguished by it’s pale color, heavily drooping petals that hang almost straight down, and its thinner foliage than E. purpurea. Slightly more drought tolerant, it is still used in cut flower arrangements for its distinct drooping look. Lastly, E. tennesseensis is unique in that its pink/lavender flowers will always be east facing for the morning sun, has upright petals related to the coppery colored center cones, and is only found natively in a few glade areas near Nashville, Tennessee. It is also a unique species of the coneflowers because it will be easily crowded out by other species due to its less aggressive growth habit. Until 2011 it was on the Federal Endangered Plant List. Echinacea are common in the Colorado garden landscape, but that does not mean they have to be boring. Plant a few varieties and species in clusters of 5 or 7 and see how you like them. Use them in the mid to back areas of more formal perennials gardens and they will provide masses of blooms in late June into August. Let the seed heads drop when dry, or carefully gather and spread them to other areas for a more natural look in September or October. Be careful to use gloves on the seed heads, as they are quite pokey when dry and ready for dispersal. Bare hands will not like to pluck the seed heads apart. Enjoy them, they are here to stay, especially around Brighton, Colorado. We’re proud to serve communities near Brighton and Broomfield, Colorado with our landscape design & installation services.